Wait... Where Exactly Did You Say I Am? 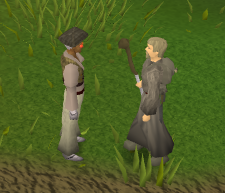 Begin by speaking to Jorral in the Outpost northwest of West Ardougne. 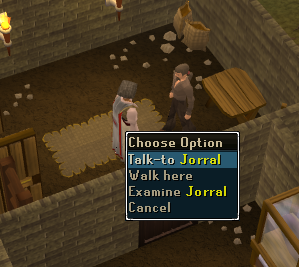 Start by speaking to Jorral in the Outpost northwest of West Ardougne. Ask if there is anything else you can help him with. He tells you that the key you received in Making History might have more uses than originally assumed. Of course, lucky-you get to investigate. Jorral hands you the Enchanted Key Notes. 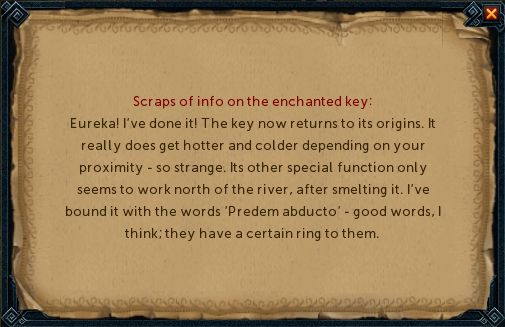 If you have finished the Enchanted Key Mini-Quest I, or have destroyed the key you received during Making History (which is used to complete the mini-quest), the notes Jorral gives you will have the Enchanted Key attached. Otherwise, retrieve your Enchanted Key from the bank to continue your investigations. Before you leave however, Jorral tells you that you can not have any items with you when rubbing the key, so offers to bank all your equipped and non-equipped items. 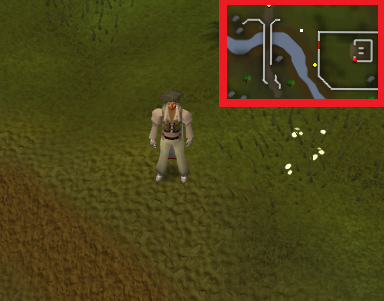 As soon as you leave the Outpost, head East towards the River that extends through Ardougne. Once you have arrived at this destination, rub the key. You will then shout the words 'Predem abducto!' and teleport using the key's mysterious powers. Upon arriving at this mysterious new area, you will be introduced with a cutscene showing a nearby farm. 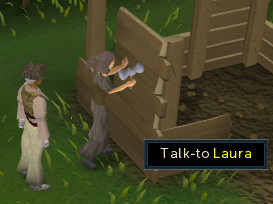 Head towards the farm and speak to Laura, who is currently building a shed. 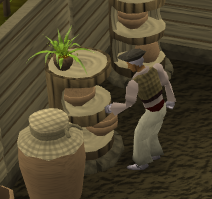 If you aren't the brightest tool in the shed (no pun intended) and haven't figured it out already, you are currently standing in past Runescape. Rub the key to return to the present and return to the Outpost to tell Jorral what happened. Before you leave, he tells you to try rubbing different parts of the key... Sounds reasonable. So head back over to the river (in the same spot you teleported from) and rub the key. A box opens allowing you to choose between Past A, Past B and the Present. For now, head to Past A by rubbing the tooth part of the key. 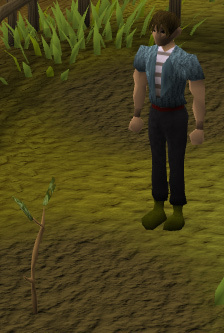 Standing back in past Runescape again, head over towards the farm. Feel free to talk to Laura again, although she is not particularly helpful just yet. Head inside and speak to Roger. He tells you he's trying to calm down his daughter, Baby Sarah. Now rub the key and go to Past B. Go in the backyard (where the plant seedlings used to be) and talk to Sarah, who is no longer a baby. She explains a vital piece of information to you. With these items in mind, go back to Past A once more. Head inside the house, go to one of the side tables. Collect one of each item: Guam, Bucket of milk and Pestle and mortar. To your left are some shelves. Go to one and take a Bowl. Now go into the backyard again and use your Bowl with the Beehive to collect some Honey . Use the Honey with the Bucket of milk to make a Bowl of milk and honey. Grind the Guam with your Pestle and mortar to create Ground guam . Proceeding onwards, add the Ground guam to the Bowl of milk and honey to create a Bowl of milk, honey and guam. Use this with Baby Sarah in the next room. A cutscene follows. Now that you have helped Roger, he offers to help you out. You ask where he comes from and another cutscene is displayed. 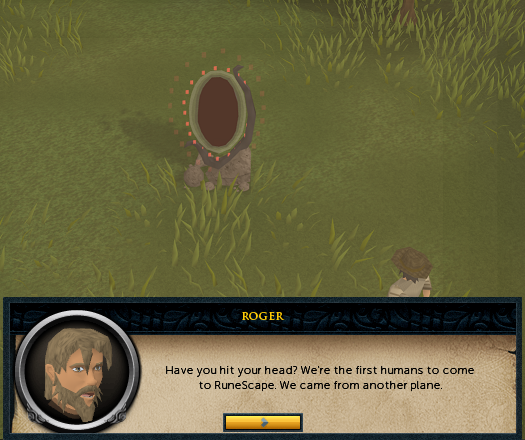 Roger soon explains that his family first arrived on Runescape through a magic portal. 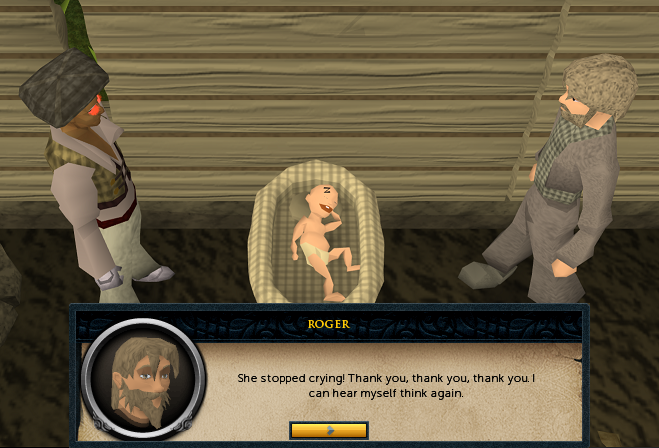 Before arriving in Runescape, Roger's family, as well as many other people, lived in a land without the monsters and strange laws of physics that engulf the land of Runescape. When finished talking to Roger, head out to the front yard and talk to Jack. After you have talked to him, rub your key and head off to Past B. After arriving in Past B, speak to Jack, who is no longer the ambitious young boy of Past A. Answer: Super Jack the Fantasmic. Answer: Cosmic, mind, body and fire runes. Answer: Trying to create fire. Jack commends you for "reading his mind" but asks you to find out why the trees his mother planted in the backyard never grew. Speak to Sarah in the backyard. She wishes she could go back in time and try planting the trees differently. 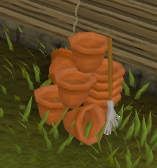 So head over to Past A and grab the spade lying on the ground, as well as these pots (you only need to click on the pile once). Now dig up each seedling and they will automatically be planted in each of the six pots . Replant each seedling in the following order by using them on each fruit tree patch. They are in alphabetical, clockwise order, if that makes it easier to remember. Speak to Sarah again, who tells you the trees have been growing well since they were planted years before. Go over and speak with Jack, who tells you how he knew about runes as a child. 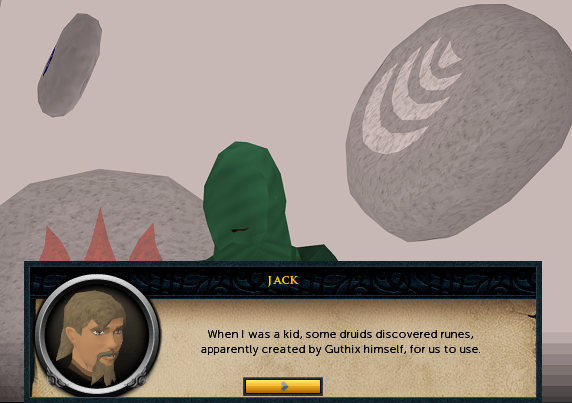 He explains that when he was a child, a druid discovered runes supposedly created by Guthix. Ever since, people have harnessed their powers and created more magic spells. Alas, the name 'Runescape' is created. After speaking to Jack, talk to Laura, now an old woman lurking around nearby. After you have finished shouting at her, she will explain that she wishes she could have been more adventurous when she was young. Time to make a treasure map. Head back to Past A and collect some Charcoal and Papyrus from one of the shelves inside the house. Use the two items together to create a Map of Runescape. Talk to Laura and you will give her the map. She says she will use it to explore, which is great because now you can talk to her future self in Past B (obviously this means go there now). Upon arriving, speak to Laura. You find out that she has done plenty of exploring in her life, after all. But she has only one regret: losing a brooch (family heirloom) somewhere on her travels. So head on over to Past A once again and go inside the house. Search the bedside table to take the Brooch. Head outside with the Brooch in your possession. Use it with the Soil mound. Now you may travel to Past B. Click on the Soil mound once you arrive. Then, grab a spade from the shed next to you. Dig up the Brooch from the Soil mound and speak to Laura. Laura explains that when her family first came to Runescape, they were greeted by Guthix. Although she fails to mention the involvement of any of the other gods. Use the key to tele back to the present. 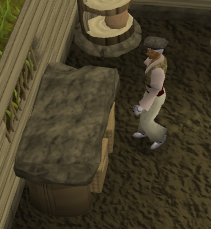 Head over to the Outpost and speak to Jorral. Old Tome giving 2,500xp for 3 stats above level 25. The first two readings are 1,000xp and the last is 500xp. 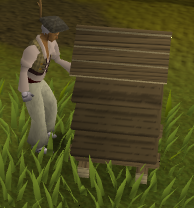 Ability to explore the farm in past Runescape. Access to Enchanted Key Mini-Quest Part II. 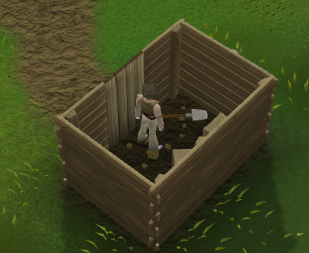 As with Making History, having completed the Quest you will find yourself with an enchanted key that you can use to find treasure around RuneScape by digging in the correct location. Below is a summary of locations, however for a more detailed solution, see the guide. The locations are not exact, as for each bundle of treasure is a small area (rather than a single square) that you can dig to find the treasure. Slightly south of the east part of the Gnomeball arena. West Karamja coast, west of Brimhaven. Level 5 Wilderness, north of the Grand Exchange, near an entrance to the Chaos Tunnels. Mine in the middle of Karamja, north-west of the Nature Altar. West of the hut where you buy the Hunter Skill Cape. 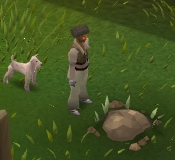 Level 28 Wilderness, slightly west of Bounty Hunter. Eastern part of level 20 Wilderness, to the east of some Green Dragons. North of the gates, at the entrance to the Death Plateau. Level 54 Wilderness, in the western end of a cutting, north-west of the Chaos Elemental. [^] Speak to Jorral in the Outpost. [^] You'll get the Enchanted Key and Enchanted Notes. He will also bank any items if you decide to do so. 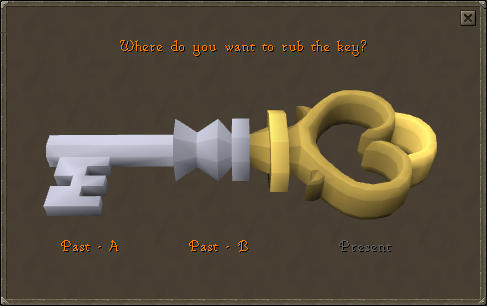 [^] Rub the key until you find the correct location, which is northeast of the sheep pen, north of Ardougne. Refer to the guide for exact location. [^] Speak to Laura in the farm. [^] Rub the key and go to the present, go to Jorral and tell him what you saw. [^] Go back to the teleport spot and rub the key, choosing Past A. [^] Talk to Laura and then to Roger, who will tell you to calm his baby. [^] Rub the key and talk to Laura, who is in the back yard. [^] In one of the shelves nearby, you'll find a bowl. Use that bowl on the beehive outside. [^] Use the Milk on the Bowl of Honey, grind the Guam and use it on the Bowl of milk and honey. [^] You will get a Bowl of milk honey and guam. Use it on the baby. You will now go through a cutscene. [^] Travel to Past B and talk with Jack. In the dialogue pick the option "Superb Jack the Fantasmic", "Cosmic, mind, body, and fire runes", "Misalionar", "Seven", "Trying to create fire", "Create chocolate cakes", "Good", and "Strawberry". [^] Talk to Sarah in the backyard. [^] Go to Past A, pick up a spade and take some pots. [^] Use the spade on each of the trees to get the seedlings. [^] Replant the seedlings, referring to the guide for the location. [^] Go back to Past B and talk with Sarah and Jack. Now watch the cutscene. [^] Talk with Laura, who will want a Map of Runescape. Go to Past A, get some Papyrus and Charcoal from the shelves and use them on each other. You will get a map, hand it to her. [^] In Past B, talk with Laura again and she'll want her Brooch. Return to Past A, take the Brooch from the bed-side table and try to go to past B, you will lose the Brooch. [^] Take the Brooch again (in Past A) and hide it in the Soil Mound outside. Return to Past A. Get a Spade and dig on the Soil Mound and talk to Laura. Watch the cutscene. 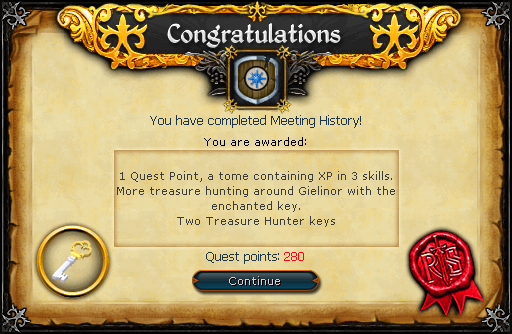 [^] Talk with Jorral and...Quest Complete!